Half of voters believe Crooked Hillary broke the law with her private email server. 27 percent of voters still aren’t sure about it yet. Nice. So the Democrats are running a crook. About half of voters think former Secretary of State Hillary Clinton’s use of a private email server was illegal, unethical and is a “major problem” as the Democrat seeks the presidency. According to a new Morning Consult national survey of 2,001 voters, nearly all of them (85 percent) have heard something or a lot about her private email usage – a key issue being raised against her by Republicans as they try to cast her as untrustworthy. Last week, the State Department’s Office of Inspector General released a report in which it found Clinton had not complied with its records-keeping procedures. 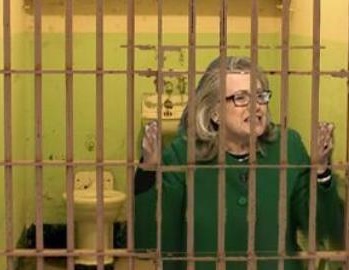 The report said while her “production of 55,000 pages of emails mitigated her failure to properly preserve emails,” the State Department still had concerns over the security of their content after it ran through a personal server in her home. Half of voters said Clinton’s use of a private email server was illegal, while more than a quarter of voters (27 percent) weren’t sure if it was legal or not. Just less than a quarter (22 percent) said they believed it was legal. Only 20 percent of voters believed her practice was ethical. Among all voters, 48 percent view the emails as a “major problem,” while 24 percent see it as a minor problem. Just 18 percent of voters said it was no problem at all. But even among Democrats, a quarter of them think it is a major problem for Clinton, compared with 50 percent of self-identified independents and 78 percent of Republicans. Clinton has denied any wrongdoing, only stating that she “should have used two accounts,” one personal and one public.